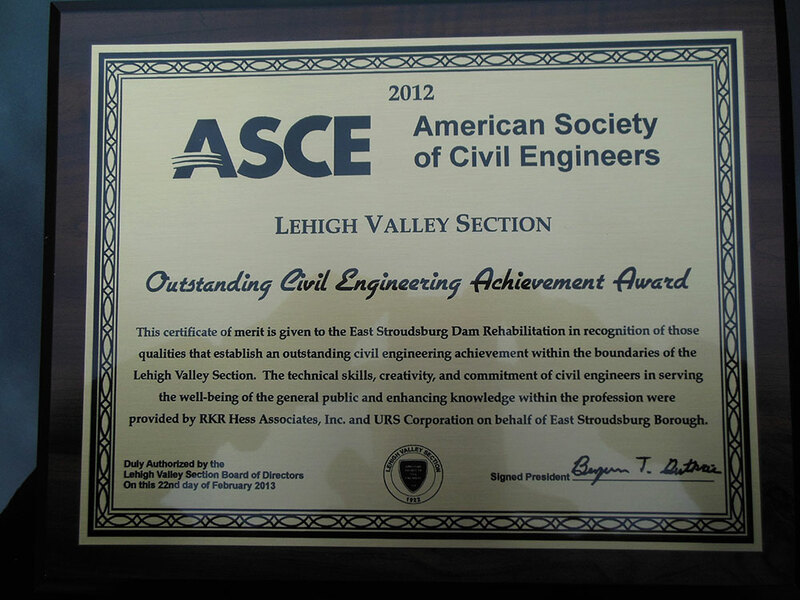 This spring, the Lehigh Valley Section of the American Society of Civil Engineers (LVASCE) awarded RKR Hess with the 2012 Outstanding Civil Engineering Award for its work on the East Stroudsburg Dam Rehabilitation Project. In collaboration with URS Corp.’s groundwork, RKR’s strategic engineering efforts took approximately 18 months to complete the dam’s reconstruction. The scope of the project entailed modifications to the original, hand-built, 50-foot-high by 800-foot-long dam and appurtenances. To retain some of the dam’s existing structure and restore more efficient functionality, RKR worked with the Borough of East Stroudsburg’s geotechnical engineer to install relief wells and a drainage system to lower the phreatic water surface at the toe of the dam. 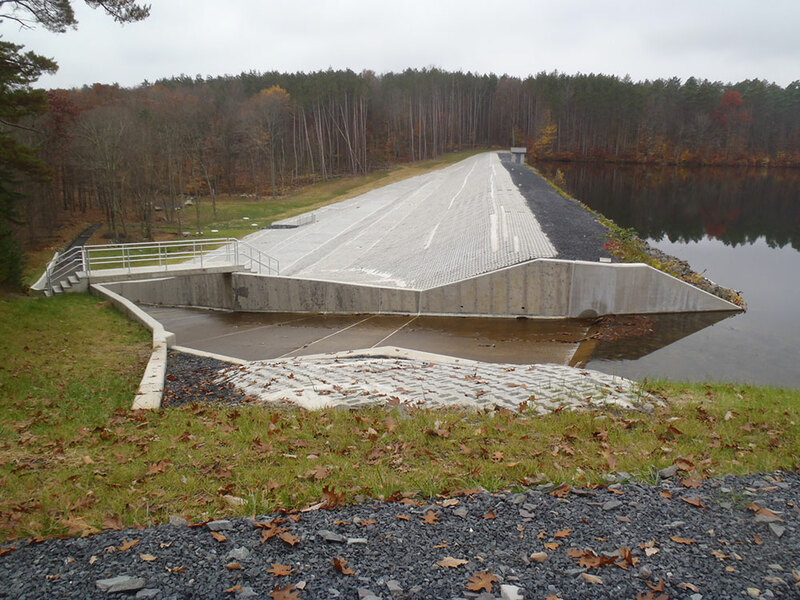 This process was completed by using more than 95,000 square feet of articulated concrete blocks to cover the dam’s original surface, thus providing proper spillover protection during an overtopping event. In addition to improving the dam’s design and operation, RKR rectified the dam’s monitoring stations to ensure that the structure and the new stabilization berm remain sufficiently sound. The firm also prepared permit applications and plans for approval, such as a PA DEP Dam Safety Letter of Authorization, an NPDES Permit for stormwater discharges, and an Erosion and Sedimentation Pollution Control (ESPC) Plan. RKR also managed the PennVEST Loan application, closing and payments for the rehabilitation project as well as guided the Borough through the grant process for the PA H2O Grant. Wayne Gross, P.E. and Dion Campbell, P.E were key to RKR’s success in this dam rehabilitation project. 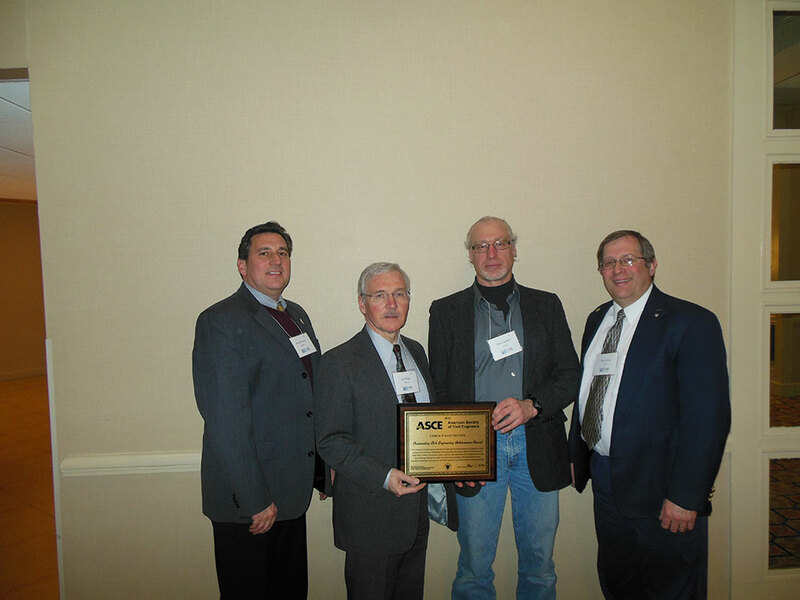 Their efforts, along with those of other RKR employees who supported the project, as well as URS and the Borough of East Stroudsburg, restored an essential system for sedimentation and flood control in the Lehigh Valley. With the bestowal of its 2012 Outstanding Civil Engineering Award, LVASCE recognized the quality and stellar services that RKR provides the community. Featured are pictures of the project, as well as the award presentation dinner held May 15, 2013. 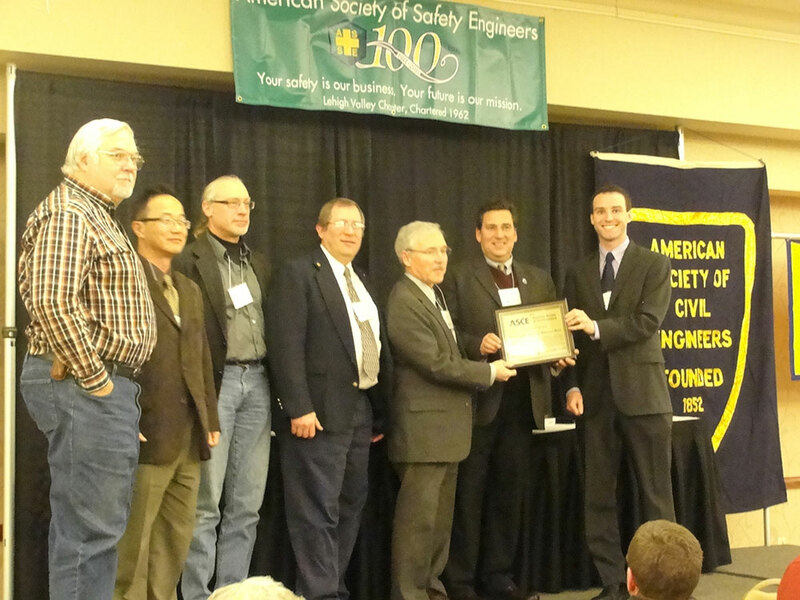 (L to R): Peter Dudko and Chulwoo Kim of URS, Dion Campbell and Wayne Gross of RKR Hess, James Phillips, East Stroudsburg Borough Manager, Roger DeLarco, East Stroudsburg Borough Council President and Ben Guthrie, ASCE Lehigh Valley Section President.